Applied to the front of the first album recorded by rock band The Velvet Underground, the “banana” logo on a white ground, with its bold Andy Warhol credit, went against the style of album covers in 1967. The band is not named on the front, there is no photograph, no album title – all this was moved to the back cover, to give prominence to the Warhol image. The gatefold sleeve may have been designed by Acy R. Lehman, but it has become known as an Andy Warhol object because of the Warhol Banana on the front, the Andy Warhol, producer credit, and liner photographs from The Factory. Warhol gave the band the run of The Factory as a practice room, and The Velvet Underground & Nico provided the live music for Warhol’s Exploding Plastic Inevitable (EPI) happenings through 1966 and 1967. Andy Warhol designed and produced covers for over fifty record albums, for classical, spoken word, jazz, rock and pop music, from 1949 to 1986. The early covers were commercial commissions, but as Warhol’s career as a fine artist progressed the covers became more and more artworks in their own right. As commercial objects, they were manufactured in print runs appropriate to sales forecasts. 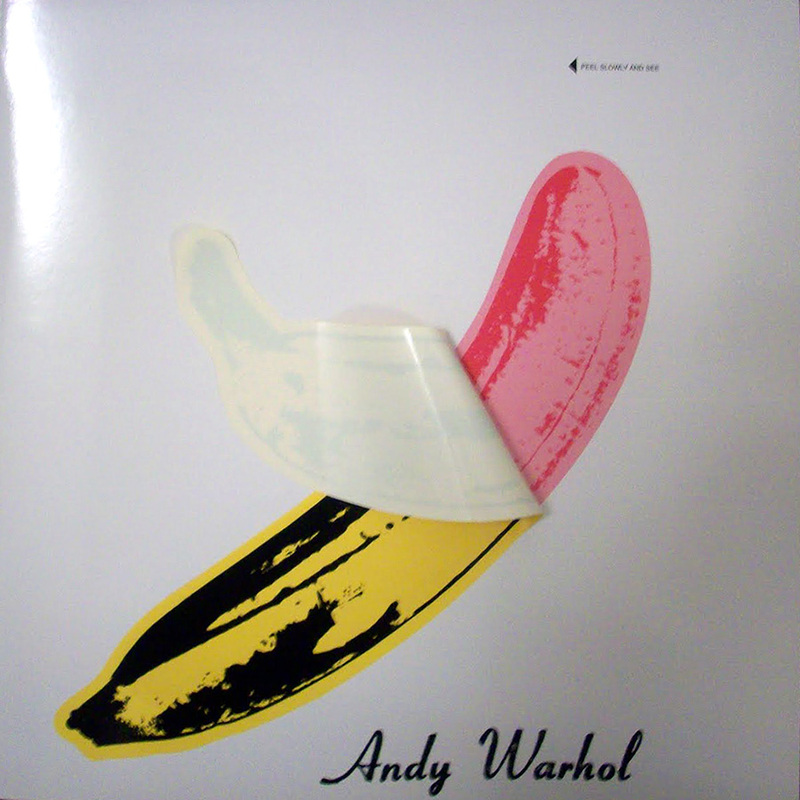 The Velvet Underground & Nico, Banana cover is distinctive within Warhol album covers, by virtue of its peel-off sticker, and in its original state is considered as a multiple artwork, having crossed over from the record collecting market into the lower reaches of the art world. By the time The Velvet Underground & Nico was released, Warhol was already an art celebrity, far more famous than the band playing the music. Warhol gifted this celebrity to The Velvet Underground to help promote the record. In exchange, the band provided music for the EPI multi-media happenings. Another aspect of celebrity could be linked to Warhol’s awareness of the fame enjoyed by the pop stars such as Elvis, and others who visited the Factory – Bob Dylan, Donovan, etc. Suddenly, Warhol was in the pop music world and some celebrity would rub off. Seduction. The album cover portrays an “erect banana,” and the instructions, Peel slowly and see… the promise of something voyeuristic. When peeled, the cover reveals a flesh pink, peeled banana. The sexual opportunities afforded by bananas crop up in other Warhol work, most obviously being eaten/felated in the film Mario Banana, and in background dialogue in a scene in Harlot, 1964 (Warhol’s first sound film) everything in the conversation related to bananas. A literal reading would note that bananas show death and decay overtly as they blacken and shriven with age. The album includes tracks The Black Angel’s Death Song and Heroin, both with death connotations. Those connotations aren’t directly attributable to Warhol, even though he is credited as the producer. Warhol paid for the recording sessions, expecting some return from sales of the album. However, with a delay in its release (a lawsuit concerning the use of an image of Factory hanger-on Eric Emerson on the back cover), initial sales of the album were low and Warhol would have been lucky to cover his investment. Since its release, The Velvet Underground & Nico has become a classic, credited with inspiring a generation of rock musicians. Reissued many times in different formats it has subsequently generated a lot of money. Original copies, with the Warhol peel-off banana sell for a high price on the record collector market. 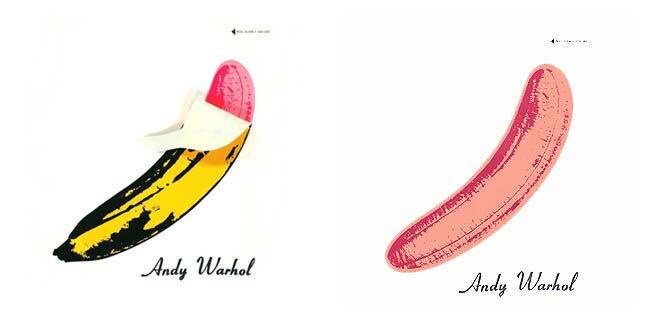 The banana image itself has assumed a high value through licensing agreements for use across a wide range of products and media – its value was the subject of a legal dispute over its use in 2012 between the Velvet Underground business partnership and the Andy Warhol Foundation. Time is not shown explicitly by the banana image, but over time the banana has assumed high status as a logo for the Velvet Underground and as a recognisable Warhol image. Other pop artists have produced covers of music albums: Peter Blake/Jann Hayworth (The Beatles/Sgt Pepper), Eduardo Paolozzi (Wings/Red Rose Speedway), Robert Rauschenberg (Talking Heads/Speaking in Tongues) etc. But none have achieved the status afforded to The Velvet Underground & Nico with its Andy Warhol Banana.